I’ve always been a huge fan of activity advent calendars this time of year. 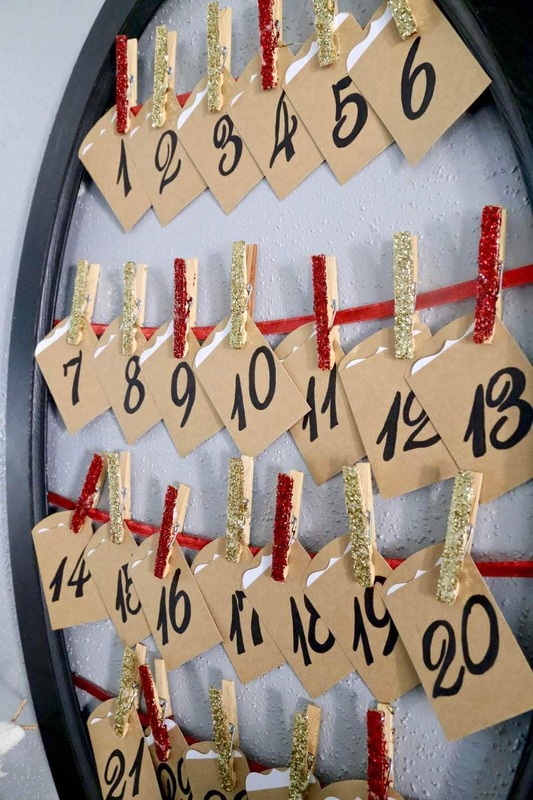 Corey and I love to come up with unique ways to celebrate the season, and coming up with fun advent calendar ideas is such a fantastic way to be intentional about soaking up every single second of the season. Also, it gives me a good excuse to eat a metric ton of cookies and spend entire days in my pajamas. I have to! The calendar says so! Our calendars have shifted and evolved a bit over the years – I’ll share a few links below to all of the different versions of our advent calendars. 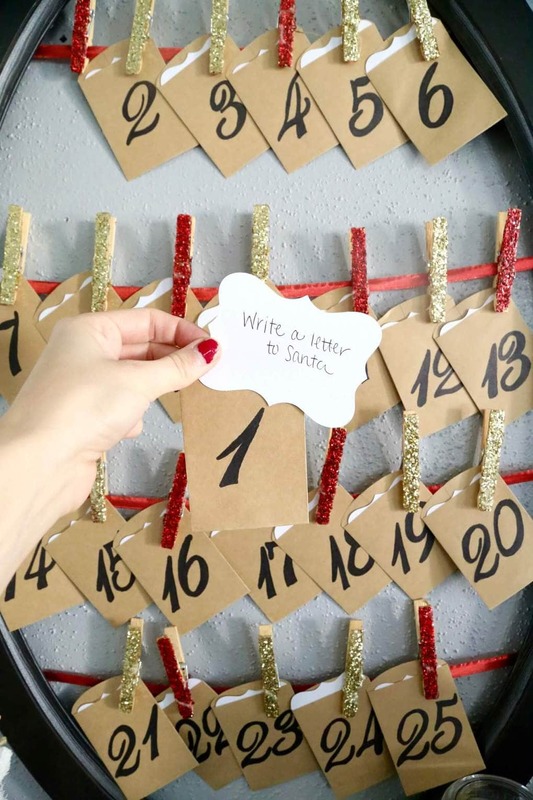 Our favorite method, however, is just a plain ol’ advent calendar (rather than a bucket list or another method) and I’m always so excited to dive in and get started. Each year, I spend a ton of time making sure that everything on our list is placed perfectly so that we don’t have a big activity planned for a busy weeknight and we don’t have too many “bake cookies” nights in a row. Although let’s be honest, no one would complain about that. 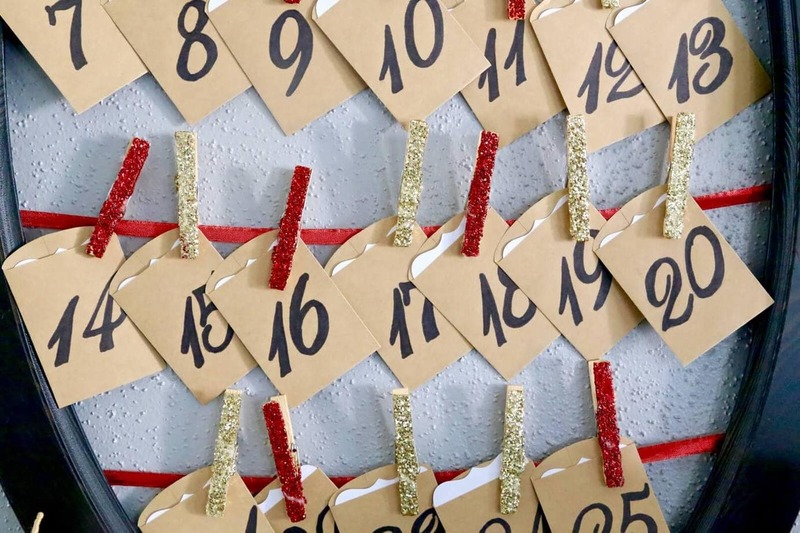 Here’s a quick list of all of our activity advent calendar ideas from years past – keep scrolling to see what’s on our list this year! This year’s calendar was incredibly simple to make, and I think it’s one I’ll keep using for a few years, at least. Let’s chat about how it’s done. 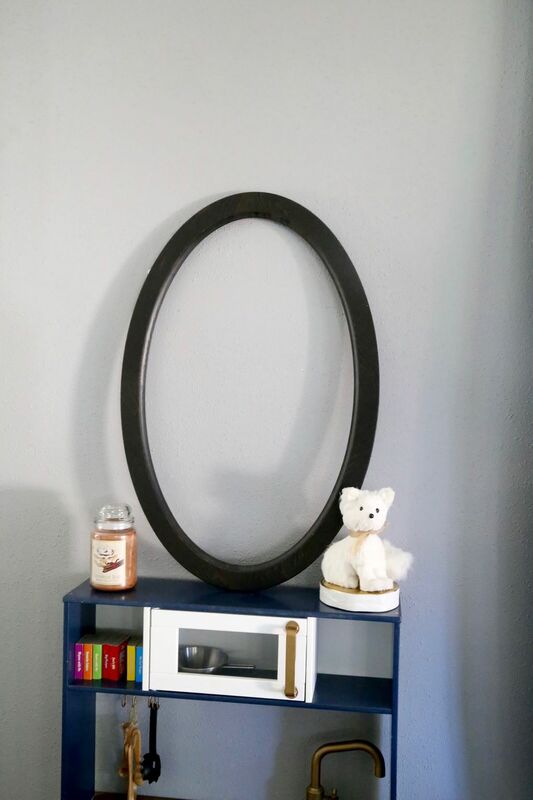 I decided to use a frame I already had laying around – it’s an old Ikea mirror with the mirror part removed (it was just held in with those little metal folding prongs). I was going to hit up a thrift store to find something, but then I remembered I had this and it was perfect – such a good reminder to check your random stash of leftover mirrors before you go buy something. What? You don’t have like 12 extra mirrors hanging out in your house? That’s just me? Anyways. 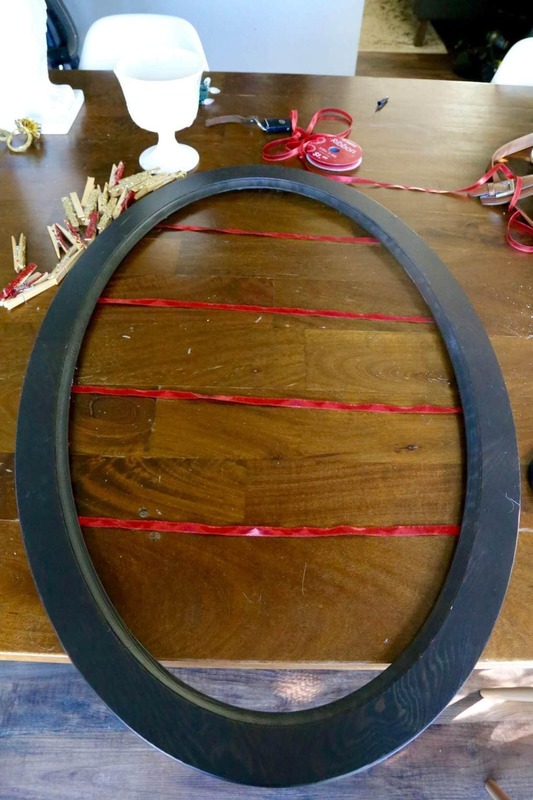 To make the frame itself I grabbed some pretty red ribbon and hot glued a few rows of it to the back of the frame. 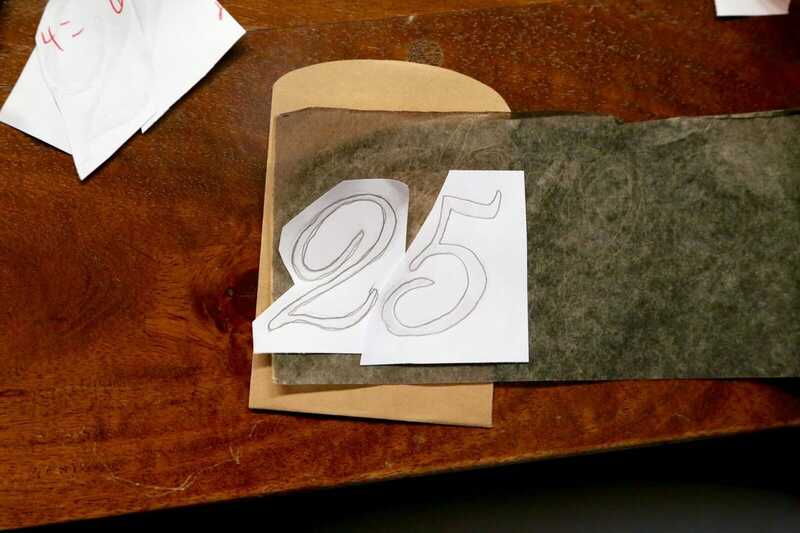 The numbered envelopes were incredibly simple to make. I just printed out some numbers in a pretty font then I used my graphite transfer paper to get a nice outline on the envelopes. Then, I traced over ’em with a Sharpie. Done! 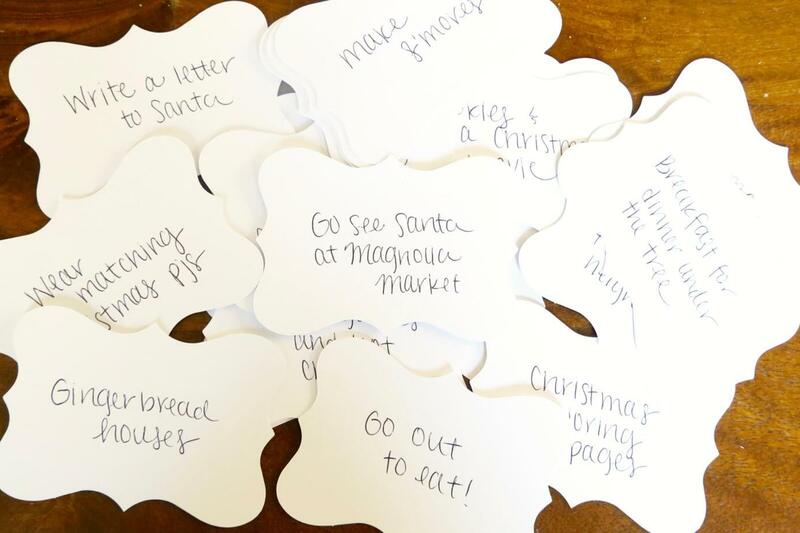 I didn’t do anything fancy with the cards – we probably won’t re-use these from year to year, so I just wrote our activities on them with a pen. Then, I clipped them up on the frame with the glittery clothespins and that’s it! I love how this turned out and I am so excited to get started. Jackson really understands what Christmas is this year and has been talking about it nonstop for weeks, so I think he’s going to have a blast with this. And even if he doesn’t, I know I’ll have a blast with it. I’ll be back on Friday with some photos of our Christmas decor this season – I’m so proud of how it all turned out this year and I really sometimes feel like my house was just meant to be decorated for Christmas all year long. 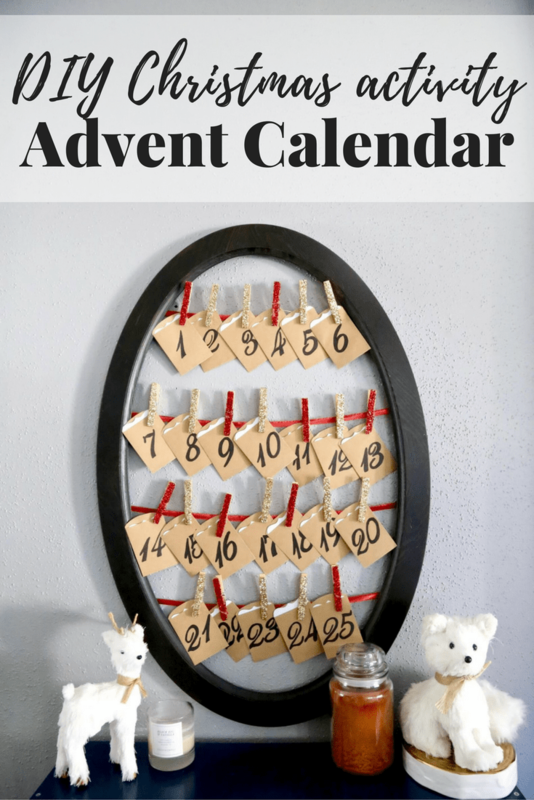 Do you do an advent calendar? What kinds of activites do you like to put on yours? I love it! So beautiful. 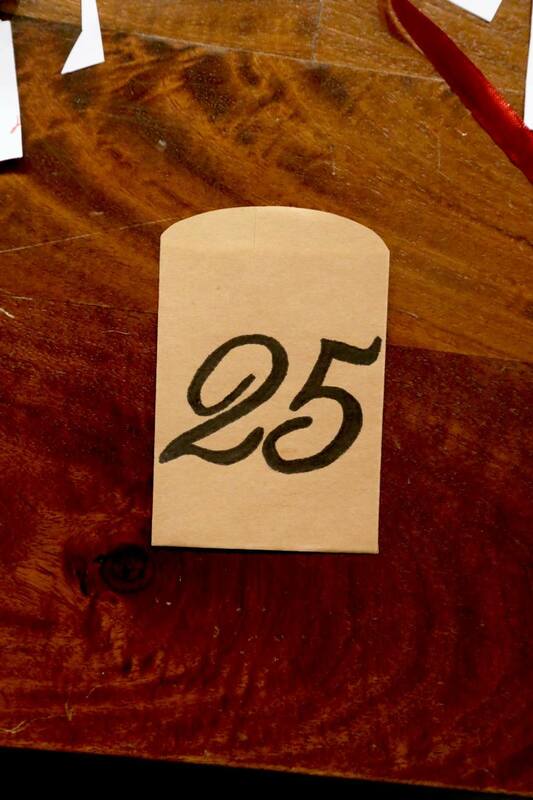 We love doing an activity everyday to countdown to Christmas too. I think this is such a sweet idea! I really love that everything this is something you can do together, way better than chocolate!! Pinning! 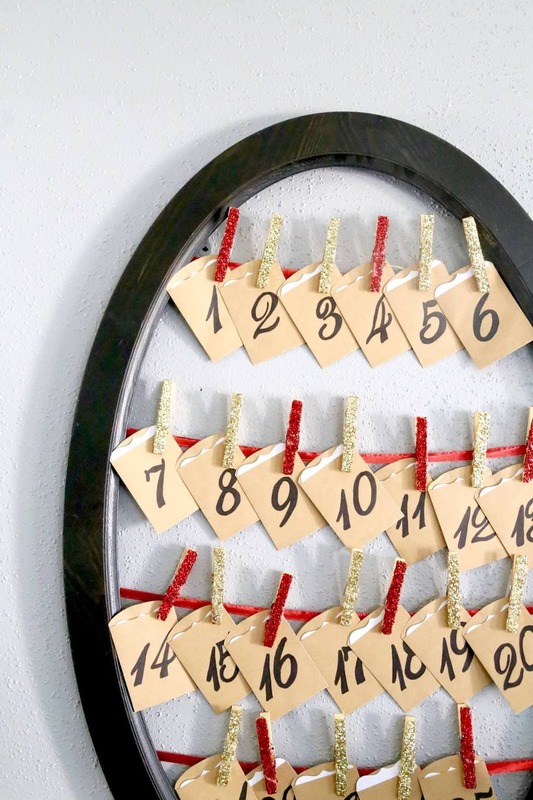 Such a cute advent calendar! I love the little activities for each day, too! 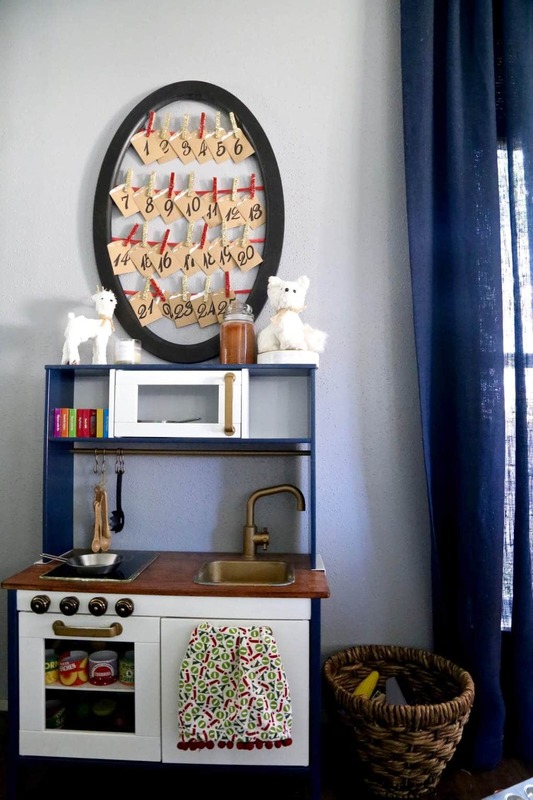 I love this idea and it looks like it will not be to hard to make. Thanks for sharing. 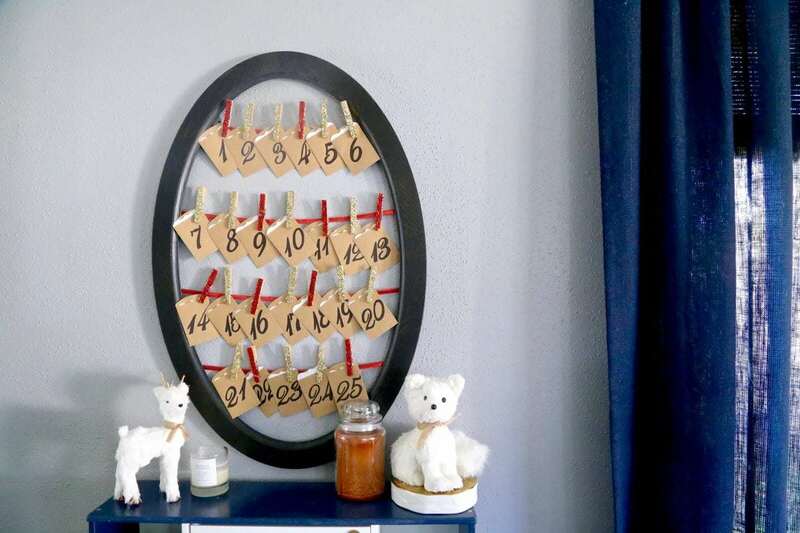 What a cute advent calendar, and would be so easy to make. I have a collection of frames that I’ve picked up at yard sales, and thrift stores. Thanks for sharing! Pinned! Funnily enough, it was your activity advent idea that got me inspired to do one too! I like to do the bucket list format so that we don’t feel pressured to go out and look at lights when we would really rather just stay home and watch Love Actually! Maybe someday I’ll be organized enough to do an actual calendar!